Bored of the same old mundane printouts? Tired of that drab, routine black on white? Okidata, a proven printer manufacturer, has brought out a unit that will handle your normal text printouts, as well as adding the capability of color printing to your computer duties. And, may I add, they've done it fairly inexpensively, too! 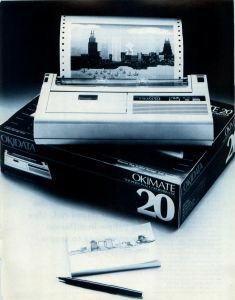 The Okimate 20 is a compact, unidirectional printer measuring 13 x 7½ X 2 ¼ inches, so it won't take up very much additional space alongside your other computer hardware. It features a comprehensive manual—perhaps the most complete, well-diagrammed, informative and easiest to understand that I've seen in some time—which runs you through the various procedures you need to undertake to make the printer ready for work with your system. To show its comprehensive nature, it gives detailed examples of troubleshooting, going so far as to suggest how to replace the print head and how to repair a broken ribbon. This completeness goes against the norm; most companies would just tell you take it to a service center to get a new print head or go buy a new ribbon. To get it to operate, you must buy an accompanying "Plug 'N Print" module that works with your specific computer, which eliminates the photocopied "addendum" that we Atari users are so accustomed to when purchasing a product for our computers. Actually, it's a fully-equipped package that includes the circuit board/interface (that easily slips into the side of the printer), a cable to connect between the printer and your computer (something I wish more hardware manufacturers would include), the previously-mentioned handbook, a stack of pin-feed paper, a disk (we'll discuss that next) and two ribbons—one color and one black-and-white. Both are in cartridge form for maximum simplicity in installation, as easy to load into the printer as an audio cassette is in a tape player. The software on the disk is substantial: There are two different screen dump utilities—both print the screen out as viewed, but one takes up less memory to allow more room for your application; the trade-off is that the latter version works slower. There are also two snort, ready-to-print demo pictures that show how well your Okimate 20 prints displays, but they're also a good test of whether there are any problems with the printer, how it operates, and how dark or light your want the output (there is a darkness setting switch on the top for manual adjustment). Okidata sports a toll-free help line to assist you with most problems that crop up. Either of the print utilities can be placed in an AUTO folder to be enabled right after boot-up; to get things running, the program is called with the Alt-Help key combination. An annoyance that surfaces with color print-outs (if that's your wont) has to do with the necessary installation of the Control Panel accessory, because you have to set up the Install Printer accessory for color output. My wish would be for the screen dump programs to handle this duty, leaving one or two accessory slots open for more useful utilities. As an alternative, you can find printer drivers available for DEGAS/DEGAS Elite and word processing programs on most online services, and from user groups, especially as the Okimate 20 becomes more popular. Once called into action, the Okimate 20 is not exactly what you'd call speedy; this is because of the method the printer uses to do its tricks. Instead of the "standard" dot-matrix manner, Okidata uses a thermal transfer, which melts a waxy ink off the ribbon and onto your paper. This means that each ribbon is only good for one pass, which limits its lifespan to about 15 color screens or 75 screens with the black ribbon. Let me add that due to this technology, the standard rough bond paper used by most printers ends up unusable. Smooth paper (like that used in photocopiers) is desirable, and Okidata makes several recommendations in their manual to help you out. In color, it takes three passes over a print line to get the various shadings onto the page, as it mixes red, blue and yellow in different concentrations to create the correct hue In my tests, it took about 11 ½ minutes for a color screen dump, and 2 ¾ minutes for a black and white screen dump. The only shortcoming in printing pictures is that the "lines" of data are often unevenly printed. Because of this, some lines end up slightly separated, leaving a minuscule gap of white in the middle of your graphic; others cause a thin slice of darkening where the two lines overlap. How dark the image is printed and the content of the picture will determine how annoying this effect is. Cost is the other consideration you must face. Being that you get so few prints from a single ribbon cart, and the price of a replacement ribbon cartridge (from Okidata) being $6.69 for a color ribbon and $5.95 for a black ribbon, this isn't your best bet for anything other than final drafts. Unlike most printers, though, you are offered another less-expensive option, that of not using a ribbon at all, accomplished by removing the ribbon and loading the printer with thermally-sensitive paper; of course, this doesn't work with color printing. As mentioned in the manual, thermal paper usually comes in rolls, and for that purpose, Okidata offers an optional roll stand for the Okimate 20. Not to ignore its other side as a text printer, it also handles that chore well—a formatted page of text prints in approximately 2 ½ minutes. Again, it suffers from the speed limitation, meaning you might choose against it if your applications require heavy-duty document print-out. On the other hand, if you opt to use it for color screen dumps or an occasional text print-out, the Okimate 20 will give you a decent, low-cost, all-purpose printer. At its price, it makes an especially fine counterpart to your regular printer.